Are Plastic Sheds Any Good? Representing quite a diverse collection of small outdoor storage ideas designed to get those creative juices flowing, the following utilities encapsulate their interiors with an impervious composition, unsusceptible to deterioration leads to futures far-afield from the distresses of frequent conserving, allowing you to chuck away those old rusty tins of varnish. Cleansing down’s best described as a cakewalk, a simple spray with a hose shower usually does the trick. We’ve turned the disgruntlement of re-coats of wood-stain into a pleasant chore, cleaning lasts minutes rather than the traditional days endurance. The structural demise roofing felt capitulates into when laid bare to the outside environment is replaced with the definitive solution to counteract weather aggression, a resin make-up combining polyethylene or polypropylene withstands all associated issues with no alteration to their manufacture. Assembly’s whittled down into the most basic of procedures satisfying DIY amateurs. The panels merely interlock & snap into position leading assemblers to drive in the screws to attain rigidity. Suncast represent the most straightforward, assembly-friendly process, even supplying the tool to secure. Great for novices. Mini dimensions resolve the issues for positioning in the tightest of location spots compared to large walk-in constructions. Situated around patios, swimming pool areas, restricted backyards and barbecue decks are firm favourites whilst choosing a low height circumvents planning restrictions, becoming increasingly strict across many zones nowadays. When you combine these advantages, reasons becomes apparent why people are purchasing additional petite styles to organise outside gear as opposed to suffering inconvenient frustrations spacious facilities can incur. 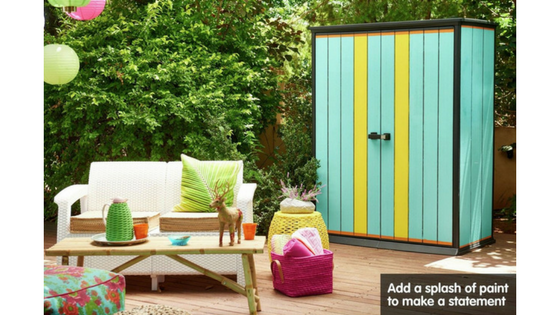 The High-Store furnishes any patio with stylish charm. Born out of Oakland’s walk-in collection this tall outdoor cupboard design exhibits silvery attraction, intended to add a touch of rustic eye-appeal to any home-yard however set your ideas in motion as this facade caters for customisation. DUOTECH™ have devised this unique composition paintable, smartly binding a resin talc formula with polypropylene produces a surface destined for a splash of acrylic paint. Whether high-gloss, semi-gloss or matt finish lights your candle, local hardware stores cater for an abundance of colour choices enabling to accentuate any outdoor setting. Polypropylene equips this exclusive make-up with durability delivering immunity from decay. Rigidity is produced & denting is prevented by inner reinforcements of a ribbed structure enveloped by double sided sheets whilst to the touch textured grain delivers an authentic wooden sensation. Twin doors stretch across the shed’s width & height simplifying access enabling to attain the entire storage collection without stepping in due to the narrow depth whilst a ramp threshold aids to effortlessly roll in a small mower. Instructions provide accurate measurements for fitting your own shelves catering for a diverse mixed-bag of storage services suited to one’s location & desires. Chrome hinges, a stainless steel latching system and padlock designed hand-grip establish security whilst functioning the doors operation. Remarkable feedback certainly floods in regarding the quality of construction, the only drawback relates to the stack of screws to build. A solid flat surface provides the necessary footings determining the doors precise swing however due to the thoughtful manufacture of a one-piece floor & roof, the outcome assures a dry interior. The colour choice of Lifetime’s stylish low profile sheds relate to either their desert-sand benchmark commonly seen exhibiting Lifetime’s walk-in facility surrounds or a tanned finish. Mini dimensions welcome tight spaces; adjacent to a house wall or sat beneath the height of a typical home-yard’s fence are favoured spots for this particular model. 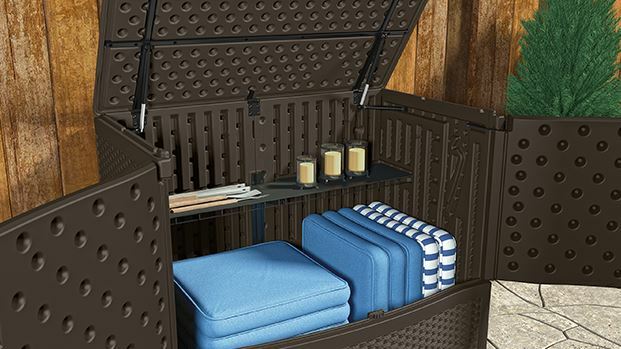 75 cubic feet interior presents adequate proportions for a cross-section of storage, catering for garden supplies, patio furniture, tools & equipment, lawnmowers and sporting goods to name a few. Alternatively, placing garbage bins out of sight, a dry house for fire logs or a remedy to appease desires by clearing kids toys spread across the garden at a moments notice. The waterproof lid works independently to the front panelled access, user-friendly spring hinges take-over lifting the hefty weight whilst restraining the expanse walloping down, averting accidents. The top stays ajar fully opened or at a 45° angle satisfying storage demands. The curvature waterproof capping laps slightly beyond the edges delivering first-rate drainage, ensuring the internal space remains aired however durable polyethylene regards their manufacture putting an end to future lid replacements, quite the antitheses of the conventional roofing felt composition. Polyethylene is molded into a stout double walled lining evading future chips, dents & peeling. Withstanding a disintegration in structure throughout changeable conditions, durability steps in ensuring the make-up remains unsusceptible to decay whilst stabilised through UV protection counteracts the shade diminishing. Wheeling gear inside is assisted by the floor’s angled threshold and outstretched frontage door panels, an integral floor sheet upholds maintaining an unblemished interior whilst a padlock-able fastener delivers all three doors triple protection. 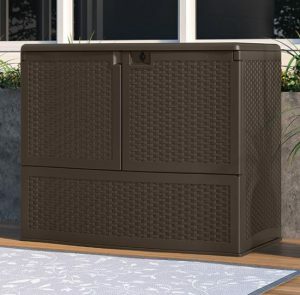 Suncast have developed the most idyllic deck box with rattan styling, purposely designed to effectuate one’s ideas in complementing the creation of a sublime patio oasis. This divine presentation exhibited in java shade stands vertical as opposed to the standard horizontal deck box shape however increasing capacity this way boosts storage potential. Chunky cushions associated with outdoor seating are awkward items for generating enough cupboard space indoors. Large furniture sets demand spacious accommodation yet it’s crucial these delicate items are kept bone dry whilst inclusive of ventilation to maintain their condition. 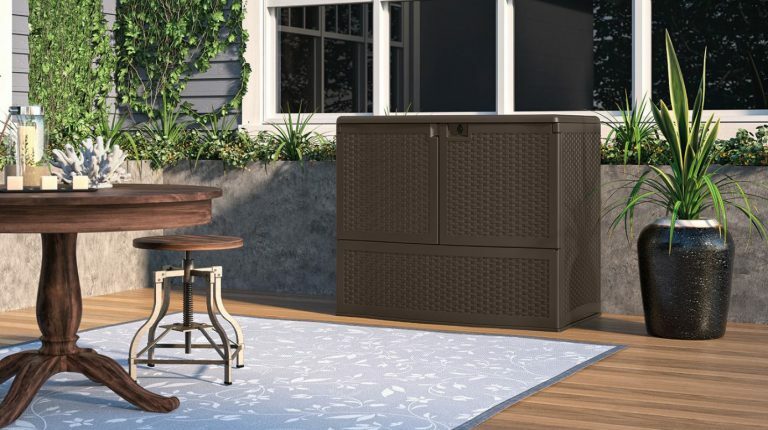 This upright deck box doubles the dimensions catering for cushion bulkiness however Suncast’s architectural design is skillfully crafted to efficiently drain rainwater whilst upholding the #1 priority in controlling an internal fresh ambience, critical to preserve fabrics. Engineered through blow molded polypropylene produces rigidity to the construction, weatherproof elements ensure immunity from damp whilst tolerating the onslaught of sun-rays without succumbing to colour decline. An automatic opening system operated by the pistons assist entry from above, once yawned however the opened position is maintained due to the pressure within the shocks. Two doors stretching the breadth deliver the frontage opening yet thoughtfully they don’t extend to the ground, preventing cushions from becoming dirty is blocked by the front panel. Described as bar height delivers convenience for placing drinks on top thanks to the flat surface; a music speaker, ornaments, plants, etc are popular displays. Inside a shelf caters for placing supplementary accessories whilst a turn-bolt device delivers three-way closure with the ability for locking the facility by means of a padlock. Fulfilling remarkable feedback regarding the attraction & design, purchasers are smitten with the brisk assembly, the panels simply clip together ‘with a snap’ and fasten into place with the inclusive bolt driver, reason it’s promoted as tool-free; clever design. Lifetime’s small scale deck box furnishes confined spaces with eye catching charm, flaunting a neutral sandy shade. 80 gallon proportions provide plenty of scope to shelter away ‘out of the house’ accessories serving the likes of terraces, balconies, verandas, patios, poolside and small garden settings. High Density Polyethylene engineered into staunch panels make up the deck box, intentionally designed to prevail against the detriment of dents damaging the sleek appearance nor subject to the skin peeling, cracks appearing or discolouration materialising to the facade thanks to UV safeguarding elements armouring the composition. 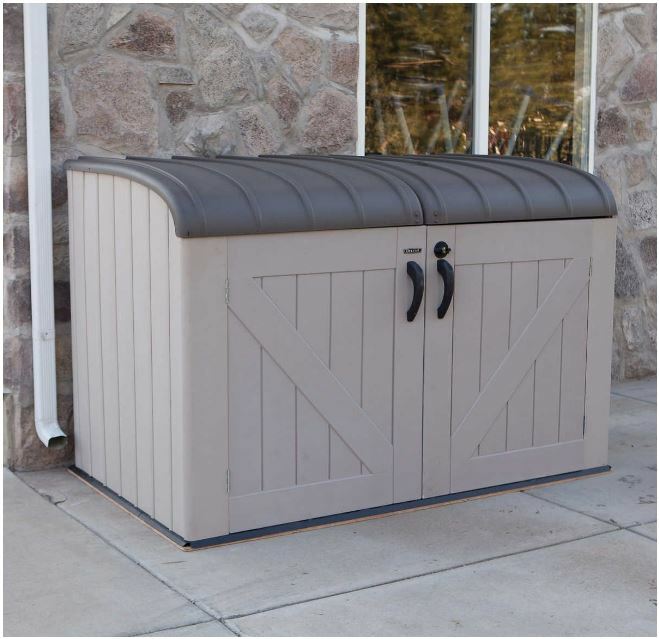 Running around the periphery to where the lid closes against the box body lies a waterproof seal accomplishing a barrier to resist rainfall from entry delivering the perfect dry environment for seating cover storage. 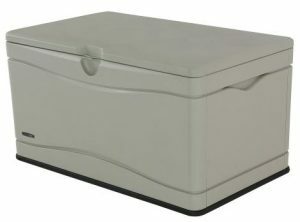 Child friendliness is a pivotal part of Lifetime’s design, okay the lid’s expanse isn’t overweight compared to the larger deck box styles however the spring hinges that operate the swing, brake the lid from crashing down on hands whilst the tension held within assists in maintaining an ajar position as the video below presents. This small unit takes a bit longer to construct than competing similar styles however the procedure’s straightforward if the instructions are carefully followed. Delivering three-way services, the flat lid offers robust seating and the use for table-top assistance, the reason it’s adored in various compact outdoor locations, even benefiting alfresco dining. There’s a flourishing selection of compositions designed to sustain weather-blight being introduced onto the market. Armoured resin endures the elements combating facade spoilage invaded through decay. Stable flat ground provides the ideal substrate for their services however like any shed, hold out from positioning in future flood water, they are all prone to seepage if left to swim. Their convenience bypasses headaches local planning laws instigate, a shower-down swiftly sparkles their exterior whilst a ‘quick fix’ assembly procedure delivers a snap of a construction compared to large structured projects. Attractive Deck Box Styles suited for Compact Layouts:. Hope we’ve provided stimulus for your storage ideas. Always happy to hear your views. Please share these ideas across the web. Thank you! 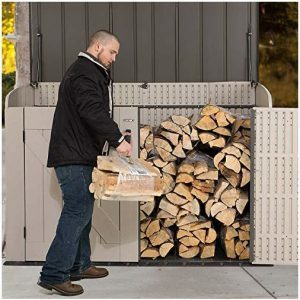 Simon, This is fantastic review of outdoor storage boxes. I love how varied they are in different looks and sizes to enclose all our storage problems in an attractive way. I know of so many people who have no way to store outdoor things like toys, mowers, pool toys like rafts and floats, and outdoor seat cushions so they just leave them out in the elements. Not good, plus a horrid sight. I live in the states. Is there a place we can purchase them here? 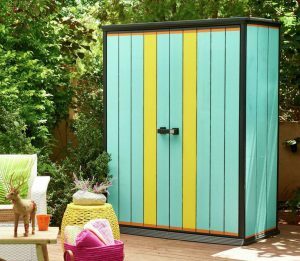 Thanks for browsing these ideas of small outdoor storage solutions, hope you’ve received plenty of inspiration. Just above these comments where this post ends are links to detailed reviews regarding a whole variety of similar units, enabling to enhance ideas further. Yeah, gardens cluttered with outside gear & toys etc plays on my mind too. I’m okay with a mess hidden away but not out on sight. 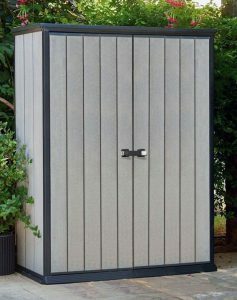 These types of facilities deliver an attractive solution to organise storage, the reason many people are opting to purchase additional mini sized sheds nowadays as their assembly is quite a doddle compared to the larger styles plus their unobtrusive constructions are able to fit in most confined garden spaces. Copyright © 2019 Quality Plastic Sheds.